When intercepting SL2’s breakbeats and piano hook from the rave classic “DJs Take Control” in “Crystal Caverns 1991”, all old-timers will be sold. No wonder the track was chosen for the teaser single, which predicts the arrival of Lone’s first full-length for the reanimated Belgian label R&S. But the record is not a nostalgic trip to the foundations of the label, because “Galaxy Garden” offers a trend-conscious showcase of 2012 sounds with a blend of UK garage, house and techno influences, in descending order. Lone AKA Matt Cutler presents an array of smooth rhythms, like in the opener “New Colour”, a jazz-house minded cut that sets the tone for entire album. Other highlights are “Raindance”, which hosts broken rhythms and euphoric stabs and “Earths Lungs”, adding synthetic Glockenspiel to hefty bass lines. Machinedrum’s hazy vocals are featured in “As A Child” and in “Cthulhu”, while Anneka’s female voice adds a late night house feeling to “Spirals”, for a joyful leadout. “Dream Girl / Sky Surfer” is carried by rainsticks and chords with a Latin note and of two chord intermezzi, “Dragon Blue Eyes” is a sheer beauty. 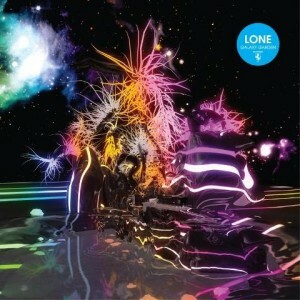 Apart from floor functionality, Lone’s playful tunes would fit to Tokyo game arcades, as would Rustie’s sound wise similar “Glass Swords”. Lone expresses the friendly face of electronic music and carries certain warmth across twelve tracks, with a clear intention to please the crowds in bigger clubs. Also, I have to say that it’s difficult to think of any better sleeve design to depict liquefied and multi-colored sound textures on offer here.